Mother’s Day is this weekend. A call, a card, or a nice flower arrangement for mom are the typical gifts for this occassion. 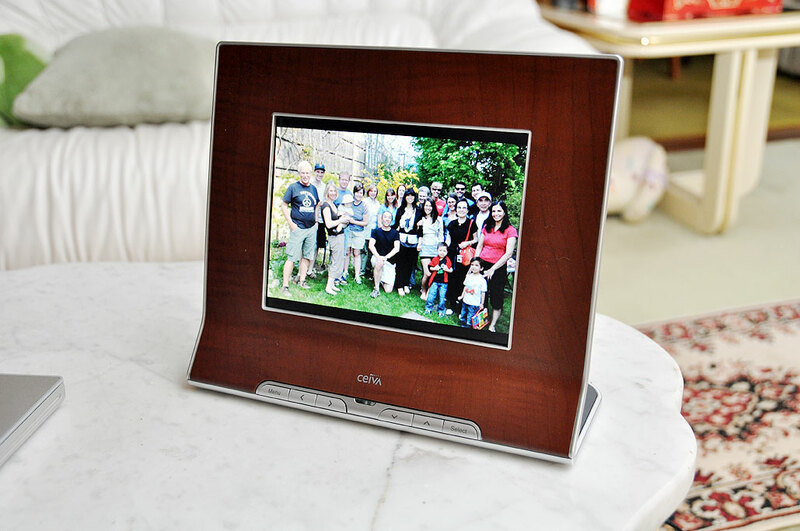 In recent years, digital photo frames have been a big seller for this event. However, some are realizing that some moms just were not all that into all of the steps needed (hooking up the USB cable, organizing the images, uploading them from the computer) to get images into these devices. The folks at Ceiva, those clever cats, have always known this. Their ten-year-old business is not just about the selling of digital photo frames. They provide a convenient, easy to use, end-to-end photo sharing capability. No other digital frame company offers both the frame and a service like this. The early Ceivas service did allow folks to send images to “mom” remotely, but it had limitations: low resolution; restrictive placement options; bulky frames. Their latest offering, however, is fully “mom-friendly,” assuming mom has WiFi in the house. WiFI is important for the Ceiva because it means the frame no longer has to be near a phone jack, and thus (thus, I say) may be placed anywhere in the house as long as it can be plugged into a wall socket. 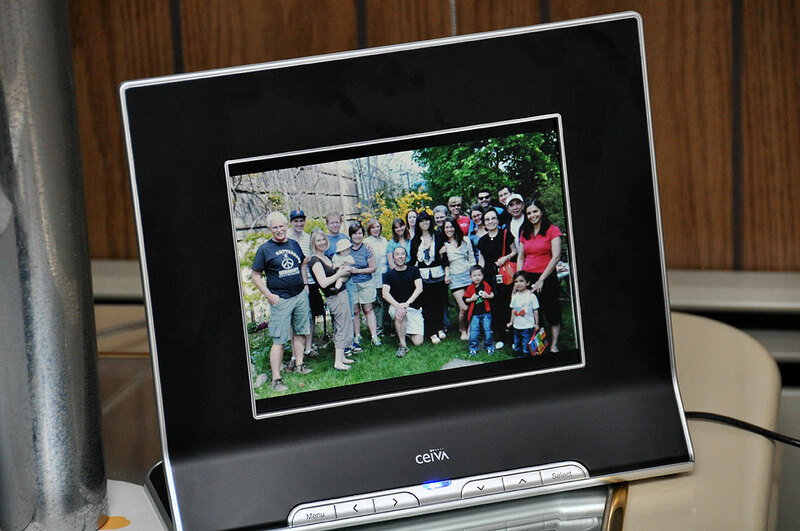 Similar to some other digital photo frames, the CeivaPro has a large 8″ display and intuitive on-screen menus. The 640×480 resolution is less than others in the market, but it’s not really noticeable with an 8″ LCD. In the rear of the frame are the various portsand slots. The slots support most of the currently available flash memory formats: Compact Flash(r), Memory Stick(r), Memory Stick PRO(tm), Memory Stick Duo(tm), Memory Stick PRO Duo(tm), Secure Digital(tm), SmartMedia(tm), MultiMedia Card(tm), Microdrive(r), xD-Picture Card(tm), miniSD(tm) Card. The ports (USB for WiFi adapter , RJ-11 for phoneline) support both WiFI and POTS connections. There is also an optional broadband adapter available for those who want to directly connect the frame via an Ethernet. In our opinion, if you don’t have WiFI access, don’t bother. Yes, you can make it work, but there will be cables everywhere. The front buttons access the on-screen menu that controls display modes, rotation and deletion, slideshow transition and timing, screen on and off times, etc. Included with the frame are two interchangeable face-plates, one black, one wood-like. Changing face-plate is a simple matter of popping off the one in the frame, sliding the other one into the slits at the bottom, and pressing the plate back in place. Custom frames and designs are available from Ceiva to personalize the look in a variety of ways. We have always liked Ceiva’s concept even when we thought the technology lagged behind the potential (for some reason I’m humming the Oompa-Loompa song). With their WiFi-enabled digital frames, we believe the current implementation (direct updates, broadband speed) has mostly caught up to Ceiva’s vision. In tomorrow’s FirstUse review of the CeivaPro, we will take a look at how images actually get “pushed” to the frames.